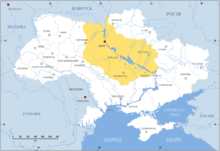 The term Dnieper Ukraine (Ukrainian: Наддніпрянщина, Naddnipryanshchyna: “over Dnieper land”), usually refers to territory on either side of the middle course of the Dnieper River. The Ukrainian name derives from nad‑ (prefix: “above, over”) + Dnipró ("Dnieper") + ‑shchyna (suffix denoting a geographic region). Historically, Dnieper Ukraine comprised territory that roughly corresponded to the area of Ukraine within the expanding Russian Empire. Ukrainians sometimes call it Great Ukraine (Velyka Ukrayina). Historically, this region is tightly entwined with the history of Ukraine and is considered as the heart of the country. The Museum of Folk Architecture and Way of Life of Central Naddnipryanshchyna is located in Pereiaslav-Khmelnytskyi. This open-air museum contains thirteen themed museums, one hundred twenty two examples of national architecture, and over thirty thousand historical cultural objects. ↑ Magocsi, Paul Robert (2010). A History of Ukraine: A Land and Its Peoples. Toronto: University of Toronto Press. p. 378.